See, I told you I'd be back with more! to have more seashell decorations! Not the scarf itself. I really like how it turned out. It's based on one I saw at a store. It the whole color theme. Ah, now this is more like it! I love these colors!!! Coasters and a bottle cozy. but you get what I'm trying to say. This set was for my mom. did an awesome job with! how many people contributed in one way or another. I could thank Ebay for hosting. Anyways, back to the subject at hand. I hope you put up with enjoyed my bragging. And seriously, I have no idea what to crochet next! You have an awesome talent! That looks great. Wow I know I could never do that..
my gram crochets white snowflakes with thin embroidery type of string?? ( on a roll) and starches them with some sort of substance... they're heirlooms in my family. 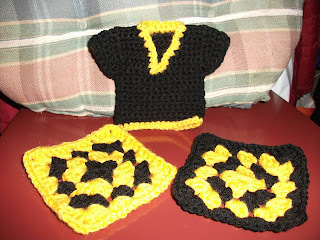 My great grandmother used to make them and now my gram makes them for the next generation. She's older now so some of us didnt' get them yet.. but i did.. and theyr'e gorgeous. I can't believe you made all those! and that was a terrific slide show! Very cute! 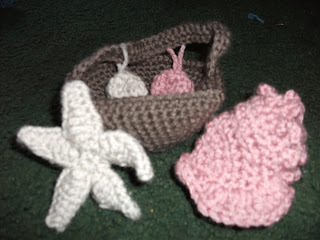 I would love to learn how to knit and crochet! you have an awesome talent my friend! Way to go! Can you share some of this talent, I wish I could do that!!! Such nice things!!! Hope 2010 is fantastic for you!! I can't even sew a button on. Seriously. So jealous. WOW! You were busy! Great stuff! 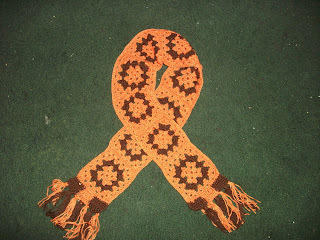 The scarf is cute but as the wife of a Steelers fan, I understand your issue with the color. You should make another one in gold and black. 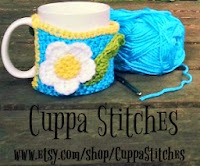 The teacup pin cushion is my absolute favorite! I love it! Oh thanks again. YOu made me smile. I am glad you did this twice. Thanks..
love the sea shells! you need yourself an etsy shop! stat!!! 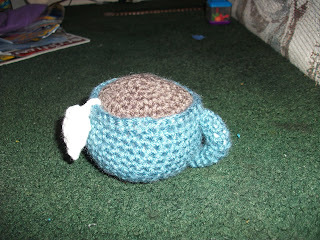 I wish I could crochet, I don't have the talent you do! I saw a pattern a while a ago and wish now I had the patients. I have to know where you get your patterns!! I need some new stuff to make. I've been doing stocking caps, scarves, and granny-squares and am ready for some new challenges!! How do you have time to do all this, Evonne? Seriously! I know how busy you are with other stuff! Super-mom!! !